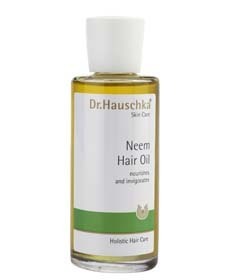 Neem Hair Oil-Strengthens fine, limp hair and softens strong, dry hair. Provides intensive care for chemically treated hair or hair that is brittle from excessive exposure to sun, wind or salt water. Natural shine is restored, leaving hair soft and manageable. Peanut oil extracts of: neem leaves, camomile wheat germ oil lecithin alcohol essential oils of: rosemary and others.